Home > Copper Patina Effects > Modern Masters Blue Patina Aging Solution - 4 oz. 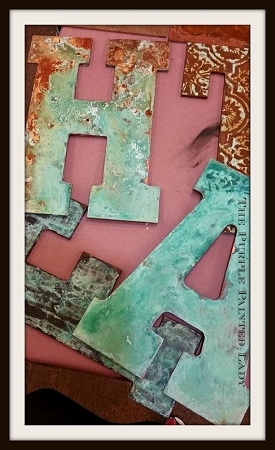 Immediately after applying your second coat of the Copper Reactive Metallic Paint, while it is still wet and AFTER you have applied the Green Patina Aging Solution and waited a few minutes - apply your BLUE Patina Aging Solution. Also- you will want to experiment on smaller samples or pieces with this! 1. dropping on some tablespoon size puddles of the Blue Patina Aging Solution in various locations in different spots that do NOT have the Green Solution. The Blue Aging Solution and Green Aging Solution will eventually merge and just becomes one. But try to to only add enough where they merge slightly and not just form a lake of soupy solution where they are mixed together solid. I DO recommend leaving voids where you want your copper paint to stay bright and coppery WITHOUT putting any aging solution on them because I love seeing little spots of copper still through this effect! Allow solutions to dry on their own and evaporate. This may take a good 6 to 8 hours- but they will! 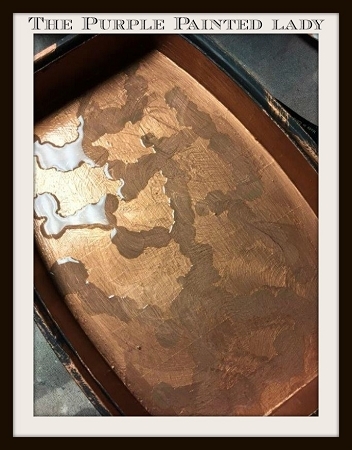 It is important you formed a slight dam around the other perimeter of your surface when you applied the Metal Affect Acid Blocking Primer (STEP 1) and your Copper Reactive Metallic Paint. This dam seriously is very slight, but you are creating a lip to hold liquid in. Please make sure you have a protective tablecloth on your work area and - consider even placing a drop cloth on your floor- if you tend to be messy. Applying Painters Tape around the outer edge will NOT work. We are sorry – there are NO RETURNs when it comes to paint products.